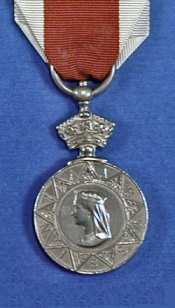 This is an unusual medal bearing the small head of Queen Victoria to the obverse inside a 9 pointed star with the letters making up the word ‘ABYSSINIA’ appearing between the points. The reverse has an embossed name of the recipient often including his number and regiment or ship within a laurel wreath. The suspender takes the shape of a ring attached to a crown which is sweated to the medal. Red with white stripes to each edge and 1.50” wide. 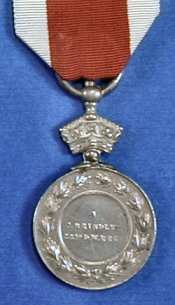 Normally embossed naming appears on the reverse of this medal in small capital letters however some issued to native troops are engraved. This medal was costly to make due to the embossed nature of the naming requiring a die to be cut for each individual medal’s reverse. Although the medals were struck at the Royal Mint (with a blank reverse) the naming was carried out by the firm of G. Austin who used an unrecorded method of punching mild steel cylinders with the name which was then used to hammer the reverse of the medal. This resulted in flattening of the obverse which is evident on most examples encountered today.